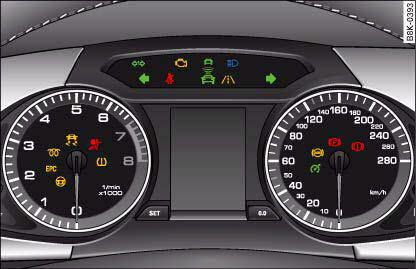 The warning and indicator lamps indicate a number of different functions and possible faults. Additional warning and indicator lamps are displayed on vehicles equipped with the adaptive cruise control*. A number of functions are monitored by the auto-check control. If a malfunction should occur, this will be shown by the display in the instrument cluster either with a red symbol (priority 1 – serious malfunction) or a yellow symbol (priority 2 – other malfunction or item requiring attention). If the warning lamp lights up when you switch on the ignition and goes out when the engine has started, the dynamic steering is activated. If the warning lamp stays on after the engine has started, this indicates a malfunction in the system. You can continue driving carefully at reduced speed to the next qualified workshop, however the steering may feel heavier and its response may be more sensitive than usual. In addition, it is possible that the steering wheel will be off centre when driving in a straight line. Have the system malfunction in the dynamic steering repaired by a qualified workshop as soon as possible – risk of accident. • If the warning lamp flashes, this indicates that the dynamic steering is being initialised. The message “Dynamic steering: Initialising” ⇒ page 36 will appear in the driver information system display. • The stabilisation functions of the dynamic steering are not available in the event of a system malfunction. This warning lamp monitors the engine management system on petrol engines. The warning lamp (Electronic Power Control) lights up when the ignition is switched on to show that the lamp is working properly. If the warning lamp lights up while the vehicle is moving, this indicates a fault in the engine management system. The engine should be serviced by a qualified workshop without delay. The indicator lamp lights up to show that the glow plugs are preheating. Your vehicle is equipped with an automatic glow plug system. The indicator lamp lights up while the glow plugs are preheating. If the engine fails to start immediately, the glow plugs have not finished preheating. In this case, keep the clutch pedal depressed (or keep your foot on the brake if your vehicle has an automatic gearbox) until the engine starts. • If the glow plug indicator lamp should start flashing while the vehicle is moving, this indicates a fault in the engine management system. The engine should be serviced without delay. • If the indicator lamp fails to light up when the ignition is switched on, this can mean that the glow plug system is defective. The engine should be serviced. This warning lamp monitors the electronic stabilisation program. • It flashes when the ESP or traction control system (ASR) intervenes while the vehicle is in motion. • The warning lamp will light up continuously if the ESP or the traction control system (ASR) has been switched off using the ESP OFF button. • It lights up when the ignition is switched on and should go out again after about 2 seconds. This signals that the lamp is working properly. • It will light up continuously if there is a malfunction in the ESP. • It will also come on if a fault should occur in the ABS because the ESP operates in conjunction with the ABS. If the battery has been disconnected, if the battery voltage is very low, or if the engine has been started from an outside power source, the ESP system will perform an initialisation of the various on-board sensors while you drive the first few metres. The warning lamp will light up during this period. It will go out when the initialisation has been completed. If the warning lamp lights up and stays on after the engine is started, this may mean that the control system has temporarily switched off the ESP. In this case the ESP can be reactivated by switching the ignition off and then on again. If the warning lamp goes out, this means the system is fully functional. For further information on the ESP. This warning lamp monitors the airbag and seat belt tensioner system. The warning lamp should light up for a few seconds when the ignition is switched on. If the warning lamp does not go out, or if it lights up, flashes or flickers when the vehicle is moving, this indicates a malfunction in the system. This is also the case if the warning lamp does not light up when the ignition is switched on. If a malfunction should occur, have the system checked immediately by a qualified workshop. If this is neglected, there is a risk that the airbag system and/or belt tensioners may not be activated in an accident. The tyre pressure should be corrected as soon as possible if it is too low. If the symbol flashes for about a minute and then remains lit after you switch on the ignition, there is a fault in the system. Please contact the nearest qualified workshop as soon as possible. 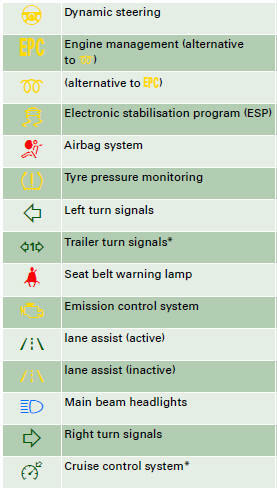 For more detailed information on the tyre pressure monitoring system, please refer to. Depending on which turn signal is operated, either the left or right indicator lamp flashes. Both indicator lamps will flash when the hazard warning lights are switched on. If one turn signal should fail, the indicator lamp will start flashing twice as fast. This does not apply when towing a caravan or trailer. The indicator lamp will stop flashing if one of the turn signals on the vehicle or the caravan/trailer should fail. For further information on the turn signals. The warning lamp acts as a reminder to fasten the seat belts. After switching on the ignition, the warning lamp will remain lit until the driver and front passenger (if applicable) have fastened their seat belts. When the vehicle has gathered speed you will also hear a warning chime. For further information on the seat belts. If the warning lamp lights up continuously you should take your vehicle to a qualified workshop as soon as possible in order to have the fault rectified. If the warning lamp flashes drive on at reduced speed and seek professional help in order to avoid damage to the catalytic converter. The indicator lamp confirms that the system is fully functional. You will be warned if you are about to cross the lane markings detected by the system. For more information on the lane assist system, please see. The warning lamp indicates that the system is switched on. However, you will not be warned if you cross the lane markings. For more information on the lane assist system, please see. The indicator lamp lights up when the main beams are on or when the headlight flasher is operated. For further information on the main beam headlights. The indicator lamp in the instrument cluster lights up when the cruise control system is operating. If the ABS warning lamp lights up together with the brake warning lamp ⇒ page 32, this indicates a fault in the ABS function, and possibly a malfunction in the main brake system as well ⇒ . The EDL works in conjunction with the ABS. If a malfunction should occur in the EDL, this is indicated by the ABS warning lamp . Please take the vehicle to a qualified workshop as soon as possible. For further information on the EDL. This warning lamp monitors the Audi hold assist function. Audi hold assist helps the driver to keep the vehicle stationary while the engine is running, for instance on steep gradients, at traffic lights or in stop-and-go traffic. When the Audi hold assist function is on, you don't have to keep your foot on the brake to prevent the vehicle from accidentally rolling away. Once it detects that the vehicle is stopped, Audi hold assist keeps the vehicle stationary. The green symbol in the instrument cluster indicates that the function is activated. You can now take your foot off the brake pedal. When the vehicle has been stationary for an extended period, Audi hold assist will automatically apply the parking brake. In this case, the green symbol will change to red . • If the gradient is too steep to park the vehicle safely, the display will show the message Caution: Vehicle parked too steep. The warning lamp flashes if the brake fluid level is too low or if there is a fault in the ABS system or the parking brake. If the warning lamp flashes, there is a fault in the brake system. The symbol in the instrument cluster display will flash at the same time. You can press the SET button to obtain a message explaining the fault. If a failure should occur in the ABS, the ABS warning lamp will light up together with the brake warning lamp ⇒ . • If the brake warning lamp does not go out, or if it lights up when driving, the brake fluid level in the reservoir is too low – this may cause an increased accident risk. Stop the vehicle and do not drive on. You should obtain professional assistance. • If the brake warning lamp lights up together with the ABS warning lamp, this can mean that the control function of the ABS is out of action. As a result the rear wheels can lock relatively easily when braking. This could cause the tail of the vehicle to skid sideways. Drive carefully to the nearest qualified workshop and have the fault rectified.